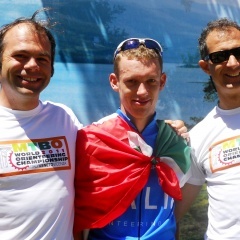 The Organizing Committee of World Championship MTB Orienteering in plan next year in Italy, Vicenza, from 20th to 28th August 2011, convey their deepest satisfaction to the whole Italian team for the historic result of Luca Dallavalle. The athlete of Trentino Alto Adige won the bronze medal in the specialty of middle distance in the World Championships of Mountain Bike Orienteering in progress in these days in Montealegre in Portugal. Congratulations also to Giaime Origgi 10 ° rated in the same discipline.